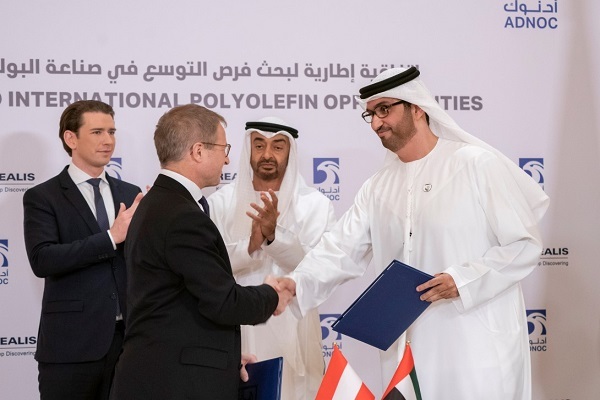 Abu Dhabi National Oil Company (Adnoc) has signed MoUs with two leading Austrian groups - energy giant OMV and leading provider of innovative plastics solutions Borealis - to explore new opportunities for collaboration in the downstream sector. These agreements were signed today (March 23) by Dr Sultan bin Ahmad Sultan Al Jaber, Minister of State, Adnoc Group CEO, and Dr Rainer Seele, Chairman of the OMV Executive Board and CEO along with Borealis CEO Alfred Stern in the presence of HH Sheikh Mohamed bin Zayed Al Nahyan, Crown Prince of Abu Dhabi and Deputy Supreme Commander of the UAE Armed Forces, and Sebastian Kurz, Chancellor of Austria. As per the first MoU, Adnoc and OMV will evaluate new opportunities in petrochemical projects as a potential extension to their existing partnerships, and exchange knowledge and experience in refinery-petrochemical integration and optimisation, said a statement from the Abu Dhabi group. The two companies will also assess opportunities for petrochemicals marketing support, it stated. The second MoU will see the duo jointly explore the potential of OMV’s ReOil technology in Ruwais, Adnoc’s integrated refining and petrochemicals hub in the Al Dhafra region of Abu Dhabi. OMV’s ReOil recycling process produces synthetic crude oil from used plastics. Dr Al Jaber said: "The agreements with OMV build on, and further strengthen, our long-term partnership across the full oil and gas value chain." "OMV brings world-class expertise and advanced technology that will enable us to further stretch the value of our crude and secure greater returns from the global growth in demand for petrochemicals as we accelerate delivery of our 2030 smart growth strategy. This is yet another stepping stone in our journey to grow Adnoc’s downstream portfolio and establish Ruwais as a global refining and petrochemicals hub," he stated. Dr Seele said: "These agreements underline our commitment to the strategic partnership with Adnoc and our readiness to bring expertise and add value to this collaboration." "Moreover, we are following our strategy of expanding the value chain and further strengthening our petrochemical business, as well as contributing to CO2 reduction through the circular economy concept of our ReOil process," he stated. Stern said: "We want to build on our joint success in Borouge and continue to deliver ‘value creation through innovation’. A sustainable development in Asia and the Middle East will show an increasing need and demand for high value, innovative polyolefin solutions."